Chris and I spent our honeymoon in Europe and we absolutely loved it because obviously – Europe is easy to love. But it also left us wanting to experience a completely different culture. After talking with well traveled friends and doing some research, we decided Japan would be the perfect place to spend two weeks. Although we missed the cherry blossoms, we both agreed that we couldn't have gone at a better time. Right after the madness of golden week, and right before the rainy and humid summer months turned out to be perfect weather with manageable crowds. We began our adventure in Tokyo for 4 nights, then the alps (Takayama, Shirakawa-go and Kanazawa), Kyoto for 5 nights (with a day trip to Nara), Hakone for 2 nights, and ending in Tokyo for one final night. I will be writing separate posts for each destination so I can get as detailed as possible without my posts being wayyy too long. To start, Tokyo is like nothing I have ever experienced in my life. There's an energy and vibrance that immediately snaps you into this invigorating place and makes you wide-eyed and eager to do everything. As first timers, we decided to dive right in and stayed in Shibuya at the Cerulean Hotel which worked out perfectly. We were close to public transportation and right in the middle of everything yet removed a bit which was nice. Shibuya is known to cater to a younger crowd and encapsulate a lot of the energy that is true to Tokyo. If I were to go back, I would stay in Shinjuku, another area that we really loved. The main areas that visitors consider staying in are Shinjuku, Shibuya, Ginza and Roppongi. More on that later. Here is what we did in Tokyo. We arrived at Narita airport around 5pm and immediately got coffee (hellloooo jet lag like I've never experienced) and our pocket wifi. Guys, pocket wifi is life changing. We paid $83 for 2 weeks of unlimited data/great connection for both of us. It worked like a charm, you just have to make sure its charged and ready for the day. We didn't have any issue with connectivity and it made our trip so much smoother than using AT&T passport in Europe. Looking back I can't believe we managed without one. I highly recommend getting this along with a Japan Rail Pass (if it makes sense for your itinerary), which can be mailed to the airport or your hotel. When we finally arrived in Shibuya, we were so close to Shibuya crossing that we decided to walk through it and meander about to get a feel for Tokyo. Given it being a Friday night, the streets were very much alive and we got to witness a true Tokyo Friday night in action - which was a very surreal moment. Given our jet lagged incompetencies, we stumbled about and then decided to grab a quick dinner to go at Tokyu Food Show, which is right beneath the station. I highly recommend it for a quick snack or taste of Tokyo. As first timers, we quickly grabbed the first things that felt familiar and ate them sadly in our hotel room before passing out around 6pm. Not my favorite experience, but definitely an eye opening one that was a good sampling variety of our future meal options. "Up and at em!" At least that's what my Fitbit read when we woke up around 5am. (5am = me just standing vertically, as I'd been up since midnight lying wide-eyed and frustrated. Jet lag is REAL in Japan.). Before arriving, I did a ton of research and made a solid itinerary of the things we wanted to do and see each day. I tried to keep it loose yet structured, allowing for flexibility yet having something to do every day so there was never time wasted doing a lot of research while traveling. In Europe, I think we winged it a little too much - and so I wanted to make sure we had just the right amount of planning in place prior to arriving. First on the list was to go to Tsujiki Fish Market - and what better day to do it than the first day we arrived, up early and ready to go. There's an option to go super early, I'm talkin' 4:30AM in the hopes of seeing a live auction. We weren't interested enough (and after talking to other travelers, happy we made the decision not to) and arrived around 7:30am, early enough to traverse around the outer market. At the market, there's an outer market and an inner market. The inner market used to open at 9am, but it now opens at 10am – so you can imagine the dilemma of arriving at 4AM to see the auction and then waiting around to go to the inner market. Decisions, decisions. This market was one of the highlights of our trip and really forced us to experiment. It's filled with some of the oddest and most delicious food you can imagine. Chris was a bit more daring than I was, as I mostly waited it out for breakfast Sushi. Baby aliens about to hatch? IDK. Another amazing thing about the market is the stores that sell authentic Japanese knives. You can watch the knives being made right in front of you and they can even ship them home. (We definitely asked, but didn't end up following through). After exploring the outer market, we walked over to Sushi Dai in hopes of scoring fresh sushi for breakfast. Sushi Dai, along with Daiwa Sushi, are both very well known for their sushi and they are just outside of the inner market. For a mere 3 hour wait, we could've had premium sushi rolling around in our bellies. Had we been there earlier for the auction, my guess is that the wait would have been shorter. Either way, we ducked into a smaller sushi place nearby instead where we quickly learned our favorite types of sushi. While the outer market is worthy of a good amount of your time, the inner market is the real deal. This is where everything goes down, and its partially gruesome yet mostly amazing. You are not allowed to take photos, yet I saw multiple people snapping away and for good reason. The processes and types of fish are unreal. After a lengthy stroll, we headed back to Shibuya to rest up and get lunch at the early hour of 11am! • Bring yen, and lots of it! You'll need it to purchase any and all goods outside of the market. • Decide ahead of time if the auction is worth seeing, because it will determine how you navigate Tsujiki. Fellow travelers told me it lasted 3 minutes total, so keep in mind your goals for the day. Is it going to the auction and getting into a great sushi place early? Or is it perusing the outer market and then the inner market at 10am? Keep timeframes in mind! You don't want to be face planted in sushi at 11 am because you're exhausted from waking up at 3am, got it? • Make sure to check if the market is open! It's usually closed on Sundays and Wednesdays. • The inner market opens at 10am and not a minute before. They are strict with this rule and you may be shuffled around until it's 10am on the dot. After heading back home, we grabbed lunch at Ichiran Ramen near our hotel. We'd heard great things so we stood in the pouring rain for around a half hour, starving from our less than substantial sushi breakfast. This ramen better be f'ing good! The ramen was incredible and it was a very different experience. The staff spoke very little English so it was up to us to figure out how to order and communicate with the servers. In this particular Ramen place, you order from a machine and then the host escorts you to a small booth (that you can share with another person if you'd like) where you are given the privacy to slurp ramen up in all its glory with all the slurping you've ever dreamed of. Highly recommend! Also, quick side note: it was at this point I noticed the sewer designs in Japan are all different and all on point. That night, we headed to Robot Restaurant for what was sure to be an unforgettable touristy and over the top experience. I booked our tickets ahead of time on Voyagin because of the discounted rate, and it worked out perfectly. There's an option to order a bento box, but we chose the ticket with a free drink only as I'd read that the food was not that great. Robot restaurant is hilarious and fun and touristy and completely crazy and I loved all of it. Before we left, I had a few people tell me it's a waste of time but I suppose it just depends on what you're seeking. For us, it was a great way to loosen up and have some fun. Since it's touristy, it's also a great way to make friends! I somehow encountered a friend of a friend from New Zealand, and we met a couple from England that we ended up hanging out with for the rest of the night. I'd call it a win and something I definitely do not regret. Plus who doesn't love glowing dragons, oversized one-eyed dolls and robots with clown wigs? After the show, we explored Shinjuku nightlife and ended up at Golden Gai, which is a small area of tiny bars that only have about 5-6 people inside (sometimes more, but usually a very small number). It was such an intimate, authentic experience and my first okonomiyaki in Japan (gotta get those pancakes!). When I went upstairs to use the bathroom, there was a tea ceremony going on! Sunday morning started early with a visit to Meiji Shrine just north of our hotel. We were definitely feeling the contrast coming from Robot Restaurant the night before, as Meiji Shrine was beautiful and serene. 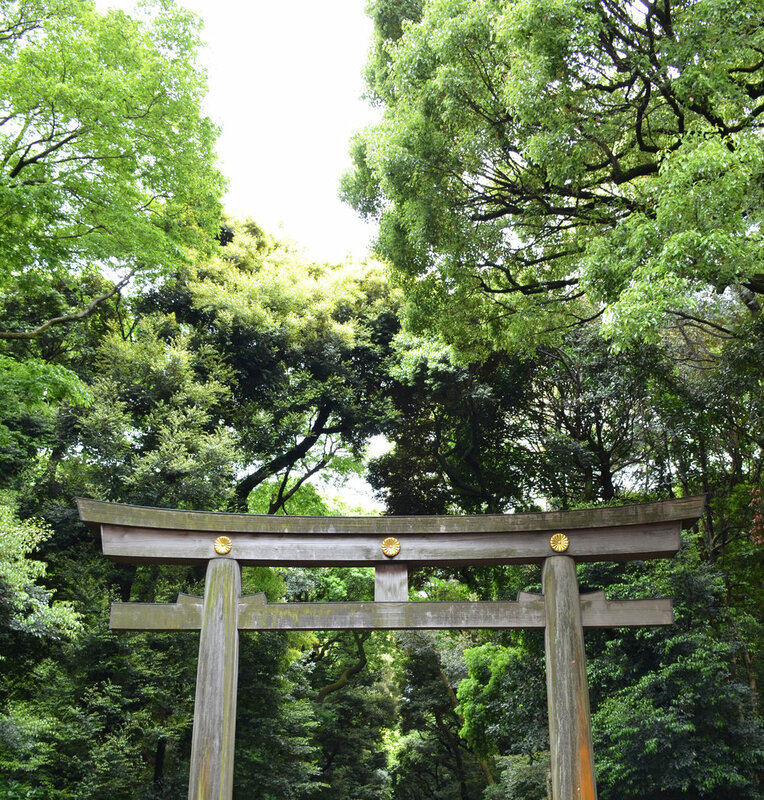 Before you reach the shrine, you walk through the Torii (pictured above) and take an incredibly peaceful stroll through the forested areas. If you go early enough (which I highly recommend) it's calm and a great time for reflection and meditation. 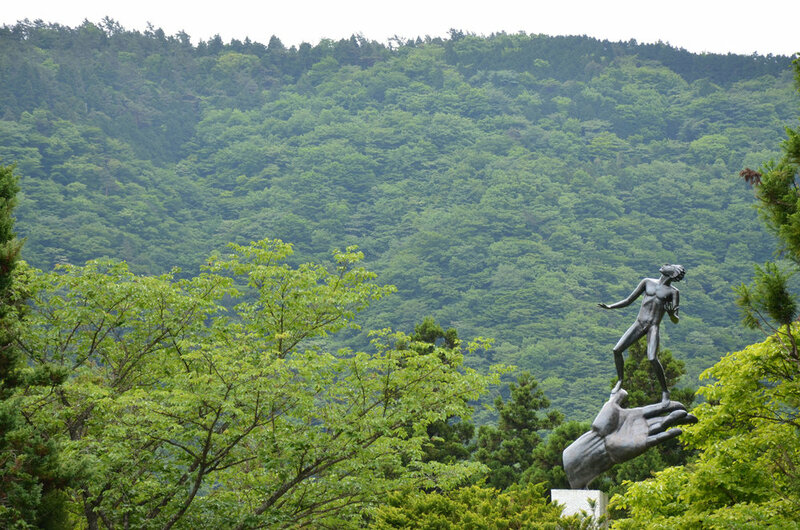 Once you reach the shrine's innermost grounds, you'll approach the Temizuya, and if you're lucky to catch a tour group like I did, you'll learn the correct way to rinse your hands and mouth. Inside, we were able to write a wish/blessing on a wooden wishing plaque to hang on the shrine's grounds amongst all of the others. You have to purchase a plaque, but for the price it's well worth it. Meiji Shrine was such a great start to our day, and we were fortunate to get an early start because it gave us the rest of the day to explore. 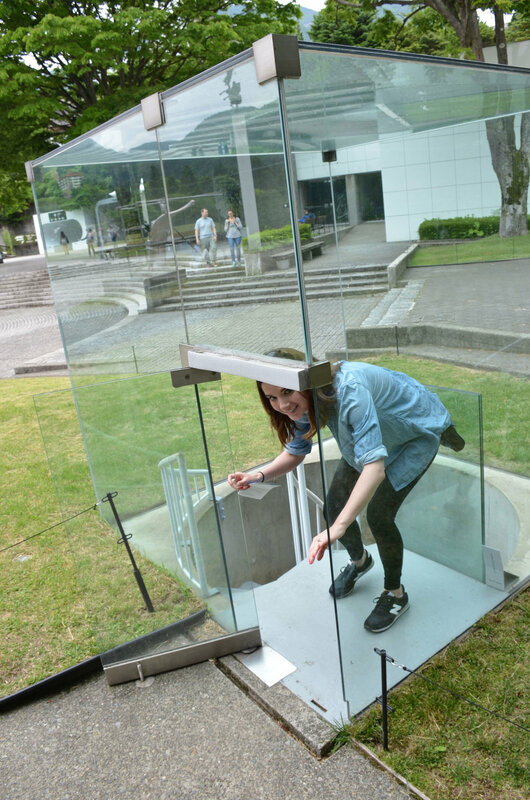 The shrine is very close to Harajuku – a must visit destination for anyone visiting Tokyo. It's where I experienced my first cat café, witnessed an owl café, bought a few souvenirs, an paid tribute to an area of Tokyo that has one hell of a personality. We went there on a Sunday, which I'd read was the best day of the week to see some of the wildest and weirdest dressed folks in Tokyo. While we did walk down Takeshita Dori but didn't witness any crazy costumes, (we probably missed the spot where it all goes down) we definitely felt the energy. One of the best things we did in Harajuku was visit Reissue, a coffee house that makes latte art of anything you want in either 2D or 3D! For us, it was our faces. And umm, we were freaked out over how much it looked like us, seriously. We laughed, took photos, and then drank our faces off. Literally. After we embraced the madness of Harajuku, we strolled through Omotesando - which is known as the Champs-Elysées of Tokyo - a great place to spend some time perusing high end stores. We didn't stay long, as we were due for a pit stop back at the hotel for a short nap before continuing onward! Since we stayed in Shibuya, we were very close to Daikanyama, an area that had been on my list since I first started researching. As a designer, I was told this area was a must - so we mustered up our remaining energy from an already busy day and made the trek (a 15 minute walk from our hotel) to this lovely area. We got lucky as it was 72 degrees and sunny, making this particularly beautiful place that much more beautiful. Our first stop was T-Site book store, nestled in the midst of lovely garden grounds. The facade of the building has a repeating white 'T' that adds to the overall thoughtfulness of the design, and it has 6 unique departments (stationary, music, books, etc. ), all worthy of your strolling time. Encountering my two friends, Photoshop and Illustrator. We also got a slice of pie at Matsunosuke bakery, and ventured out past T-site, admiring all that Daikanyama had to offer, including this man and his pups. We spent Sunday night relaxing in anticipation of the sumo tournament on Monday. Chris and I lucked out as we just so happened to be in Tokyo while a sumo tournament was going on. If you are interested, The Japan Sumo official website lists when tournaments occur. Prior to our arrival, I kept my eye on the ticket release date, and we were lucky enough to score two. Before the tournament, we made a stop at Tokyo station and explored a few fun stores, mostly through character street (a strip of shops that sell fun Japanese characters) and then made our way over to The Imperial Palace nearby before heading over to Ryōgoku Kokugikan for the tournament. Experiencing a sumo tournament live is one of the top ten coolest things I have ever done in my lifetime. The matches are quick but the excitement builds as the top division wrestlers enter the stage around 3:45pm. (The tournament starts very early around 8:30am and ends at 6pm). Since we booked our tickets ahead of time through Viator, we had a tour guide that taught us a thing or two about sumo history as well as some of the fun facts. I mean, who knew there was a Nicolas Cage look alike sumo wrestler as well as a sumo heartthrob? After the tournament, we made our way to Ginza (another popular hood in Tokyo) before our dinner reservation. Ginza is straight glamour and women were walking around dressed to impress on a Monday night - impressive. On the way, we explored Itoya, which is an amazing stationary store where we scored a few helvetica pencils and got to explore a Moleskine pop up shop inside. I was in a bit of designer heaven. We set off with our new souvenirs and made our way to dinner, starving and ready for sushi. Our dinner at Kyubey was one of the most memorable dinners we had during our time in Japan. We were able to get counter seats (book early through your concierge!) We chose Omakase, ten pieces of delicious nigiri served one at a time. Every piece was melt-in-your-mouth level and unforgettable. The owner was incredibly kind and took the time to teach us the correct way to eat sushi with chopsticks and with hands, and the sushi chefs were playful and fun - they all had a great sense of humor! I was sure to say 'Oishi', which means delicious in Japanese - and I found that it's a word that's truly appreciated when expressed after a great meal. Kyubey was the perfect way to say goodbye to Tokyo. We went home to get a good night of sleep before catching a train to Takayama in the morning, which I will cover in my next post! Tokyo truly blew our minds on so many levels. Not only were we able to do so much in 4 days, but we were in awe of how clean and safe Tokyo (and Japan in general) is. Bikes were parked free of locks and every bathroom is pristine (umm why aren't bidets the norm in the US? ). Everyone is so incredibly kind, helpful and respectful. (Not one person bumped into us in the entire 2 weeks we were in Japan, not even through Shibuya crossing). I was humbled by a culture that's really got it all figured out. To be honest, I felt ashamed that we don't emulate the same actions in the US. I'm so excited to share the rest of our journey with you! My next post will cover the Japan alps (Takayama, Shirakawa-go and Kanazawa) which was definitely a slower pace than Tokyo. Have you ever been to Japan? I would love to hear about your journey! If you are interested is behind the scenes tips and all of the additional research (from collecting killer itineraries from friends and countless hours of perusing the web), please email me at info@athingortwoblog.com. I've included a few tips below as well!